If you or a loved one has suffered a personal injury, we can help you find answers. Our attorneys are straightforward advisers, representatives and advocates. We hold responsible parties accountable for negligence and wrongful acts that cause serious injury or property damage. Have you been contacted by your insurance company? Before accepting a settlement offer, familiarize yourself with your rights and the compensation that you are entitled to. Enticing settlement offers are designed to sound decent in the short term. They are not designed to cover all your needs. In most cases, you deserve more, and we will work for it on your behalf. At Bennerotte & Associates, P.A., our attorneys offer you a free initial consultation and case evaluation. One of our experienced lawyers will meet with you and evaluate your case personally. We know how to obtain the compensation you need for recovery. With offices in Eagan, MN, we serve clients in the Minneapolis-St. Paul metro, in Rochester and throughout Minnesota. Call us today at 651-JUSTICE (651-587-8423) to schedule a free initial consultation and case evaluation. You may also complete the form below to contact us online. If you have been injured, do not accept any payment or sign anything for the insurance company until you have had an independent attorney review your case free of charge. © 2018, Bennerotte & Associates. 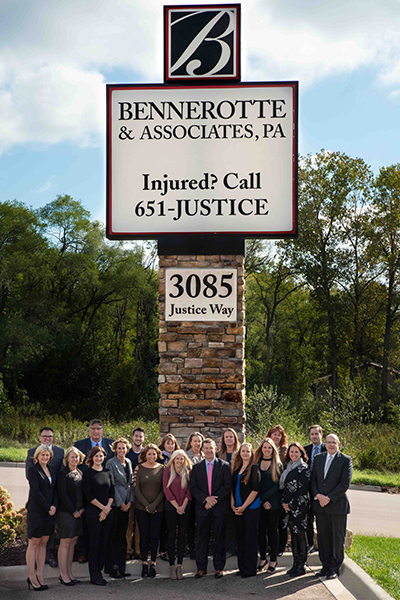 The Eagan Law Firm of Bennerotte & Associates handles all accident and injury cases throughout the Dakota County and Twin Cities areas from our office in Eagan, Minnesota.